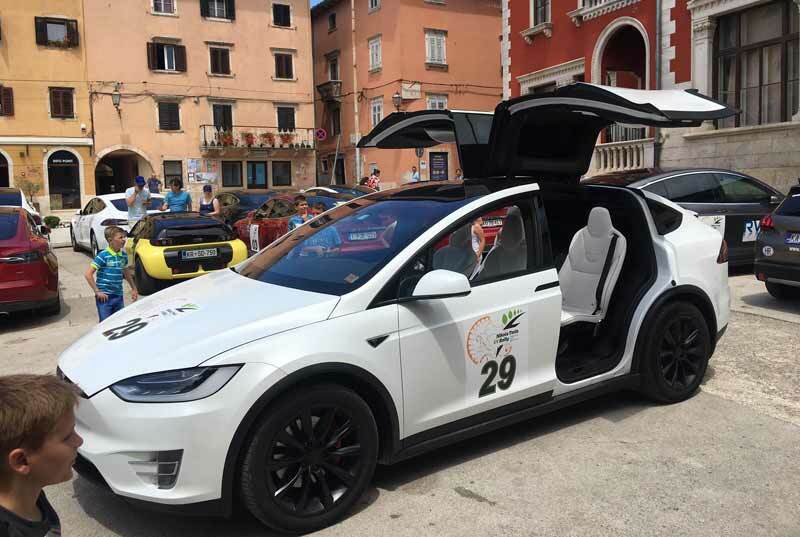 Home / Blog / Nikola Tesla EV Rally Croatia 2017. 11 Jun 13. April 2018. Every year this innovative and unique premium tourist project that combine e-mobility, ecology and tourism promotes Croatia in the best possibl way in Europe and rest of the world and this year we „broke“ several records. There was the largest number of Tesla vehicles on a ferry boat as a part of one event and largest number of Tesla vehicles charging in one place at th same time. This would not be possible without our partner HEP (goverment owned electricity distributor in croatia) who open the „grid“ so all vehicles could connect. It was the first time that anyone tried something like this and succeed! We spent cca 4 to 5 MW during the hole rally and it“s very positive that HEP is among the first in Croatia to recognize the European trend for sustainable development in energy and transport sectors. In 2016. was awarded the title „Alternative fuel Ambassador“. So far they have set 37 charging stations part of their ELEN project and plan to double it till in next year. The participants were amazed with the impeccable organization, which is a special complimet coming from Germans, Austrians and Scandinavians. They enjoyed beautiful places such as Poreč, Vodnjan, Opatija, Mali Lošinj, Zadar, Split, Smiljan (the birthplace of Nikola Tesla) and of course Zagreb, the Capital of Croatia. All locations visited on the route were carefully chosen to show best of Croatia cultural heritage, natural beauty and wine/gastro scene. Between the locations they were relaxing in 5***** hotels, Lone, Bellevue, Lav Meridien and Academia and there was plenty of adrenalin with „peed race“ on 3 location, airport on Mali Lošinj, Poljud stadium in Split and Mićevac in Zagreb. „We are very proud and happy to have such wonderful parcipants, half of them coming from the first year and allready we filled out half of the places for 2018. Next year will be the 5th year of rally and we plan something special“ say the Organizers Tina and Igor Kolovrat.